Foundation 56 values taking the fight against breast cancer to the streets…literally. The Methodist Hospital Mobile Mammogram Unit brings advanced breast cancer screening technology along with a friendly, all-female technologist staff to: community centers, clinics, businesses, churches, schools, other North Texas locations. Most major insurances, including Medicaid and Medicare Part B are accepted. Cash, check or charge are also accepted and is due at the time of the appointment. Financial assistance is available for those who qualify. To schedule an appointment, please call 214-947-0026. Where is the Mobile Mammogram Unit? NOTE: You must email us at foundation56@bradiejames.net to make sure you qualify before making an appointment. 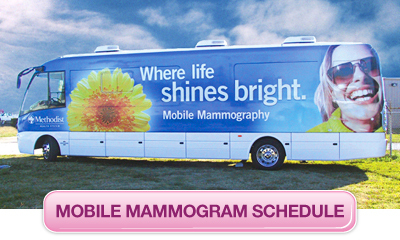 To reserve the mobile mammography unit for your community outreach event, please call (214) 947-3621.